Apple is also releasing today a 2.1 upgrade to GarageBand for iOS. The mobile sibling of GarageBand and Logic on desktop doesn’t get a whole lot of attention, but it’s a reminder that music creation remains central to Apple – even the Apple that sells the world’s favorite phone, not just the Apple that sells the Mac. GarageBand 2.1 includes some features you may or may not care about. But there’s reason to take notice. First, there’s Live Loops. Now, Apple calls this “an entirely new and intuitive way to create amazing music,” but it’ll sound familiar. You tap cells and columns in a grid to trigger instruments and sampels – so, basically, it’s Ableton Live. In this case, it’s Ableton Live cross-bred with Loopy, in that there are pictures of the loops you’re triggering. (It even borrows the circular display from Loopy and other recent mobile apps.) So it’s anything but “entirely new,” though it could be useful – and anything that draws more people to mobile music making may draw them in to third-party apps, too. GarageBand 2.1 is also Apple’s answer to what to do with the iPad Pro for music making, with an updated display and extra controls. But that story to me gets more interesting with third-party apps. But that said, I think this quiet 2.1 update is actually really important, for a completely different reason. 2.1 on iPhone 6s and 6s Plus also includes support for expressive playback of instruments via 3D Touch. We’ve seen that in ROLI’s NOISE 5D app, which even allows you to play an iPhone a little bit like you’d play their Seaboard controller. But the fact that it’s now coming from Apple means that the phone maker is committed to making this kind of control an official use of 3D Touch – a far cry from the “right-click to a context menu” that we saw first. Making this expressive is what I wanted to do with 3D Touch the first time I saw it, even more once I felt it. And it’s way more interesting and intuitive than these other applications. If Apple is supporting it officially, that means good things for third-party developers who want to play with it, too. And I hope we see this soon on iPads (along with Pencil support across the whole range) – fingers crossed or as the Germans say, thumbs pressed, so to speak. 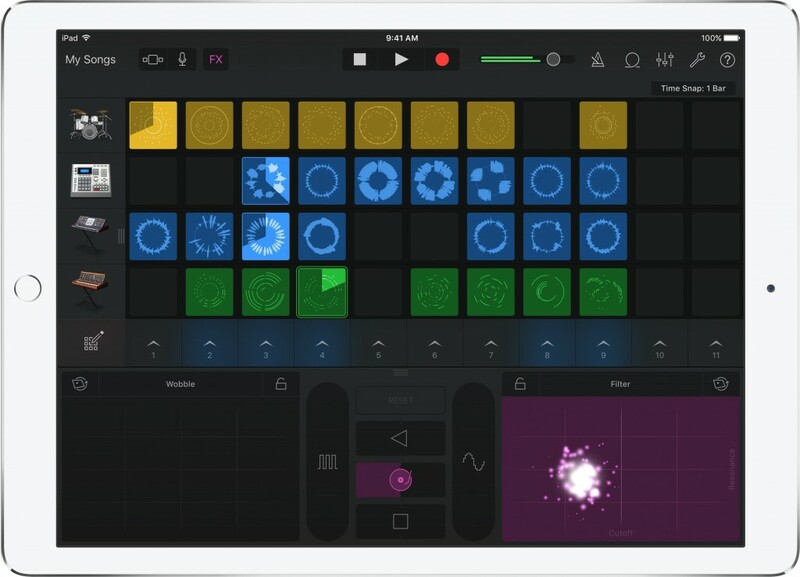 GarageBand is bundled free with new iOS devices 32GB and larger, and is available as a free upgrade on the App Store for existing users. iOS 9 or later is required.